On an early Monday autumn morning, with leaves changing colors and dropping across the city of New Haven, I found myself driving through The Hill neighborhood in the Urban Resources Initiative (URI) delivery truck, the bed full of 300-pound trees ready to be planted by the Greenskills/EMERGE planting crew. I pulled over to the side of the road to consult my map after taking a wrong turn down an unmarked street, when I received a call from another team member letting me know about a change in plans. She asked me where I was and I looked out the truck windows. At the sight of a large brick building, soccer field, and surrounding parking lot tucked in the middle of residential houses, I responded, "well, I think I'm at a school, and . . . Hey!—is that Ed in the parking lot? What's he doing here?" Having been a student for the majority of my first year in New Haven, it was a shock to find myself encountering familiar faces away from campus. I recognized Ed R. immediately from the floppy camouflage-patterned sun hat he wore all summer long in Fair Haven, a neighborhood on the other side of town. This past summer was Ed's second year as the Exchange Street Greenspace group leader and his fourth year participating in the URI Greenspace program overall, having previously worked with other groups. Over the past four years Ed has personally had a hand in planting at least 20 trees and countless shrubs and flowers. 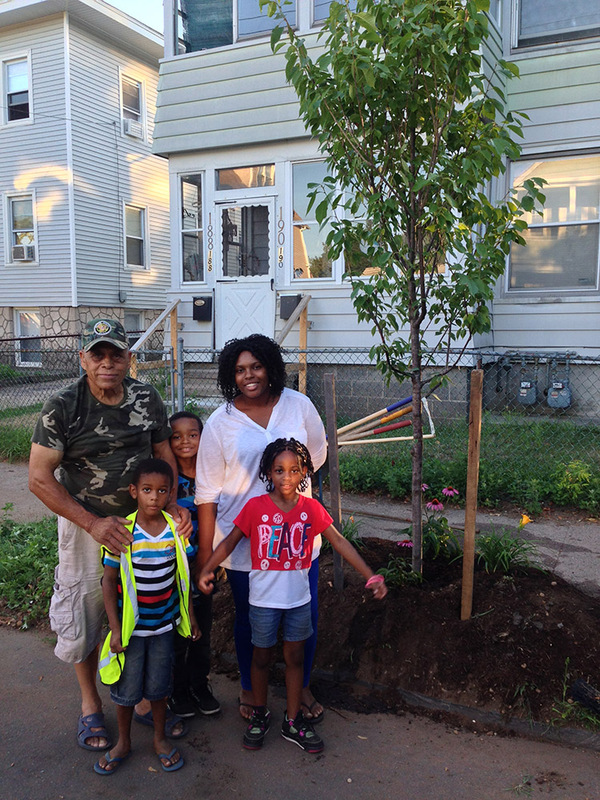 Under his leadership this past summer the Exchange Street neighborhood group brought almost 60 different people in to help with tree plantings, front yard lead remediation work, bird habitat gardens, and summer workshops. The ages of community members who made up the Exchange Street group ranged from three years old up to 80-plus. Just as diverse in background as age, the group worked to transform what was primarily a concrete-dominated street into an eclectic patch of urban forest and garden-scape. Ed does not embody the concept of leadership that many people might consider when defining a leader. He does not immediately stand out from the crowd, nor does he effortlessly bear an aura of authority, a commanding stature, or booming voice. Rather, Ed's approach seems to depart from the idea that membership, rather than leadership, is the correct mindset for community-based work. Ed demonstrates his commitment to the project through consistent participation, outreach to neighbors, an attentive attitude toward the work and people, and, most importantly, through a warm and open smile reflective of an equally warm and open personality. Working alongside Ed this past summer in Fair Haven, it was not always obvious to me where the source of his passion comes from. 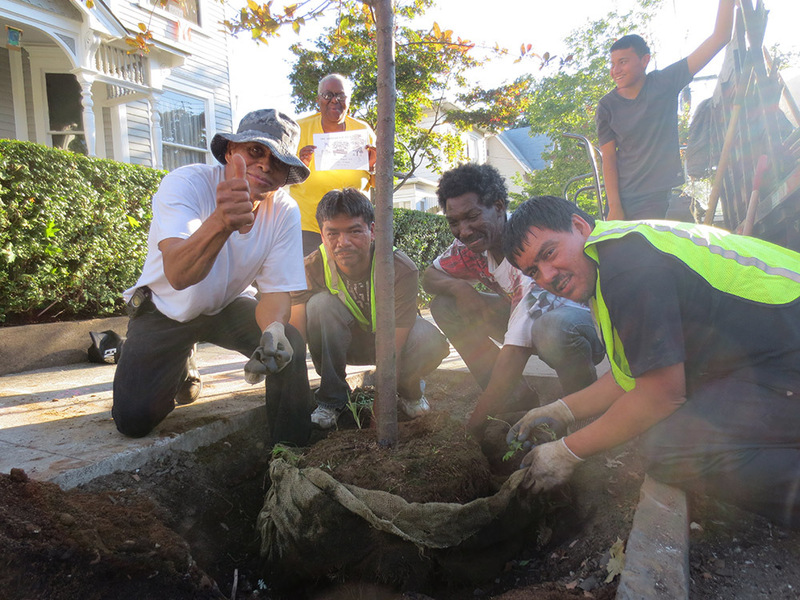 While interested in concrete goals—clean up the neighborhood, plant x number of trees for shade and beauty, cultivate a sense of pride and ownership that discourages littering, loitering, and so forth—his passion goes far beyond the bounds of his own street and immediate neighborhood. Our first days together, knocking on doors at the beginning of the season revealed a potentially rough road ahead for neighbor recruitment. For our first scheduled planning meeting we had zero attendance. Ed put on a positive face: "It was definitely because of the rain,” he said. “No one will come out in the rain." While rethinking recruitment strategies, Ed said that we didn't necessarily have to restrict ourselves to Exchange Street, that we could talk to people on the next street over, or two streets over. He was willing to volunteer his time planting trees anywhere that people wanted them. The way he saw it, there were plenty of neighborhoods in the city that desired and would appreciate trees. He was convinced that once people started they would see how fun it was and become addicted, like him. 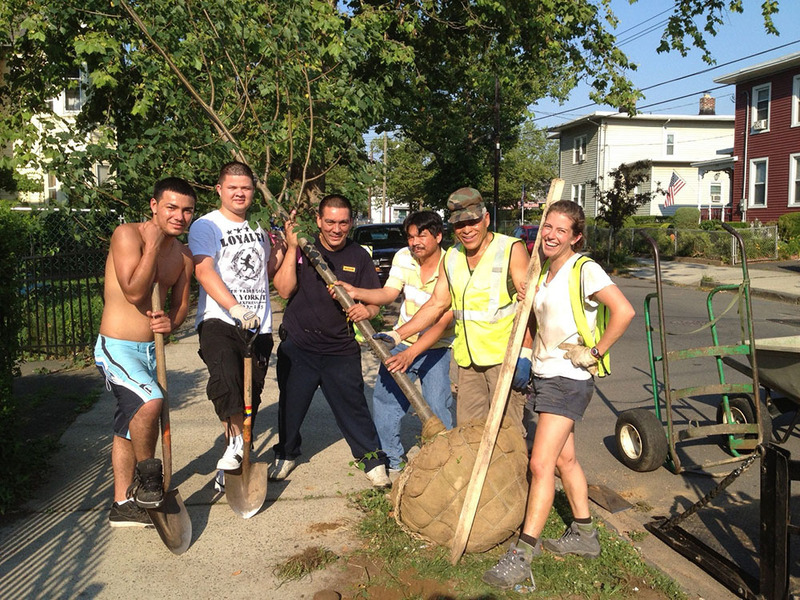 The Exchange Street group became one of the most productive Greenspace groups of 2013, in no small part because of Ed's commitment and fire for community-based environmental work. The group had no trouble keeping busy, planting across three blocks on Exchange Street. Ed’s effort proved contagious. One day this summer we were planting in front of a neighbor's house several blocks from Ed's. Other core group volunteers had been unavailable to help that day, so Ed was the only non-family member helping to plant the tree. Everyone in the house came out to participate or watch. The kids filled buckets of water and the young men and Ed dug the hole. It was a lively social affair. Conversation flowed fluidly, often switching mid-sentence between Spanish and English. Deep into digging we discovered a giant slab of concrete in the hole, still attached to the sidewalk. The high energy was slightly deflated and a struggle to break the concrete ensued. I ran to the truck to look for additional tools thinking this would be an all-hands-on-deck effort, only to return and see Ed lurching toward the truck to unload the giant slab of concrete, which he was carrying by himself. I shrieked with surprise and concern. The young men responded with reassuring cheers: "He's a Puerto Rican bull!" It was with these memories that, sitting in the truck, I hung up the phone and ran over to say hello to Ed at the school in The Hill at 7:30 on a recent Monday morning. It took him a second to get oriented when I said hello. He seemed as surprised as I was to see a familiar face at that time and place. After a brief moment, recognition set in and he gave me a big hug. He asked what I was doing there, how I was. I pointed to the truck loaded with trees and told him I was still at it. His tired morning eyes lit up with joy on hearing this news. I asked him what he was doing up so early halfway across town. He pointed into the car beside him. He was trying to coax a small boy out of the backseat and into school. I immediately recognized a seven-year-old boy who, along with his mother and two younger siblings, spent several summer evenings on Exchange Street planting, weeding flower beds, and cleaning trash during our Greenspace work nights. Ed explained that he was helping the boy's mom out because she had gotten a job as a bus driver and needed someone to get her son to school. So here was the Puerto Rican Bull—with people as with trees, both tender and loving, full of grace and generous spirit. - Story written by Gina B., who worked with URI Greenskills and Greenspace and was a Greenspace intern during the summer of 2013. Adapted from Urban Resource Initiative’s Urban Issues, Fall 2013, Vol. 24, No. 2.